The enfant terrible of fragrance has gained new territory, mounting a fragrant revolution against the neutralised world of perfumery! 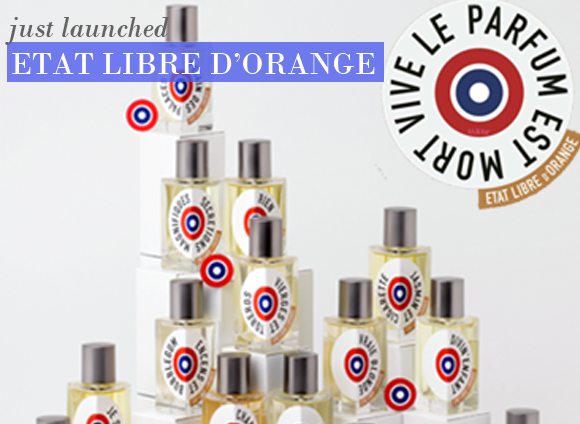 French fragrance mutineers Etat Libre d’Orange have landed with Escentual, setting up their independent state of olfactory liberalism. These playful perfumes with their colourful imagery and subversive themes are not for the prudish; they are scents for the audacious, for the naturally innovative and for the perfume connoisseurs. Evoking a raw sensuality reminiscent of the roots of perfumery, Etat Libre d’Orange is reinventing scenting in a fresh, humorous and entirely unexpected way. Launched in 2006 by fragrance impresario Etienne de Swardt, Etat Libre d’Orange was created as the antidote to taboo and convention. By rounding up the most talented of industry noses and giving them the freedom to create and express as they see fit, each fragrance is created with the utmost passion and meticulousness, harnessing pure creative energy in an innovative and skilful way. As an introduction to the formidable brand, we’ve selected a few of our favourites to capture your imagination…..
With its almost edible notes of Grapefruit, Champagne, and Cherry Lollipop Accord, Bendelirious tells the tale of serendipitous meetings between an urban, champagne-loving fairy and the man who follows her gorgeous scent from party to party. “f anyone wants to know what “spirit” is… lean your head toward him or her. Keep your face there close. Like this.” A fantastically understated scent formulated in conjunction with Tilda Swinton with notes of Ginger, Pumpkin, Immortelle Flower and Neroli. An anti-hero never lies about who he is, hence the sun-drenched simplicity of his Lavender, Musk and Wood scent. He’s the hero of the everyday with an innate modesty, a cultivated wit and an understated grace. An unexpected superman who is adored by all. This improbable alliance of Peach, Raspberry, Vanilla, Lily and Incense is an evocative, sweet scent that plays with the boundaries of sensuality. Its wearer is an impish girl who pops chewing gum in church and flirts with mystical inspiration. A sweet and girlish scent of Jasmine, Cacao and Marshmellow with an dark twist of Amber and Patchouli. It tells the tale of the art of the “American Kiss”… and that’s the most we can say on the matter! Beautiful perfume , will make for a great summer or spring perfume. Wished it lasted longer though. Got 2 hours at best , wore closely to skin after 2 hrs. This entry was posted on Thursday, January 27th, 2011 at 9:04 am and is filed under Fragrance, New products, Spotlight On. You can follow any responses to this entry through the RSS 2.0 feed. You can skip to the end and leave a response. Pinging is currently not allowed.